MCKINNEY, Texas, Apr 09, 2019 (SEND2PRESS NEWSWIRE) -- ImPowerQ Associates announced today that Blockit(R), a leading innovator in applying advanced technology to today's complex healthcare challenges, are joining the Heroes to Healthcare mission, a U.S. Department of Labor and VA approved national apprenticeship program focusing on addressing the high unemployment and underemployment rates among enlisted level veterans with healthcare occupational experience while in uniform. "Creating strategic partnerships with public and private organizations, the Heroes to Healthcare mission aims to address the critical employment challenges facing nearly 11,000 healthcare-experienced, mid-enlisted military medical professionals that transition out of the military annually," said Dave Gregorio, co-founder of ImPowerQ Associates and executive director of social impact for the Heroes to Healthcare mission. "Not only is it about preparing our heroes for employment but also positioning our mission to create employment opportunities by being catalysts for growth through collaboration among our diverse employer partners." Healthcare-experienced veterans from the enlisted ranks have been identified as the third largest cohort of underemployed veterans. The Heroes for Healthcare mission was founded by ImPowerQ Associates and designed to address this crisis by providing advanced on the job learning strategies, highly regarded healthcare credentialing content, and professional and personal skill development for veterans. The apprenticeship provides veterans with a competitive advantage in four career tracks: healthcare administration, medical assistant, pharmacy technician, and cybersecurity. 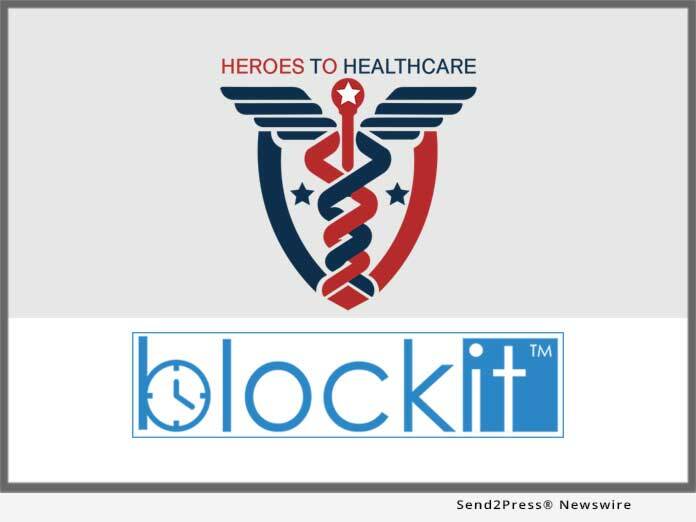 Jake McCarley, Blockit's chief executive officer, stated: "Blockit is looking forward to joining the Heroes to Healthcare mission by partnering with ImPowerQ on this important initiative. Blockit's focus on solving complex care delivery challenges requires experienced care delivery professionals working alongside our technology innovators. This partnership will not only support our veterans by providing meaningful employment but also allow Blockit to further our focus and depth of patient care insights and innovations thanks to having these highly qualified healthcare professionals join the Blockit team." "We are honored to have such amazing support from Blockit. A truly leading-edge healthcare company with a tremendous mission. Blockit's support empowers our healthcare-experienced veterans with the resources and jobs they need to obtain meaningful mission driven employment in the exciting area of healthcare innovation and technology," said Samina Hooda, president and chief learning officer at ImPowerQ. With nearly 11,000 healthcare experienced enlisted level veterans separating from the military annually the Heroes to Healthcare mission will ensure that many of these veterans will be identified and equipped to qualify for great roles at Blockit as they experience hyper growth nationally. Through this partnership with H2H, Blockit has also committed to pursuing a U.S. Department of Labor Platinum Hire Vets Medallion for this year. The Platinum Hire Vets Medallion is awarded to a select few U.S. Employers that successfully maintain very high retention of veterans hired and demonstrate a high percentage of new hires are veterans. The authors of the Purpose Quotient(R) and founders of the Heroes to Healthcare Mission ImPowerQ Associates is a leading organizational development firm focused on unlocking the latent capacity that exists in healthcare and nonprofit organizations. For more information visit: https://www.impowerqassociates.com/. To learn more about the Heroes to Healthcare mission visit: https://www.heroestohealthcare.com/. Blockit is a healthtech company that delivers advanced technology solutions to seamlessly connect disparate healthcare data systems for the purpose of easing the administrative burden on physicians, facilitating the improved flow of patient information and ultimately improving clinical outcomes. For more information about Blockit, visit: https://blockitnow.com/.